Anonymous sale; Sotheby's New York, 5 November 1998, lot 372. 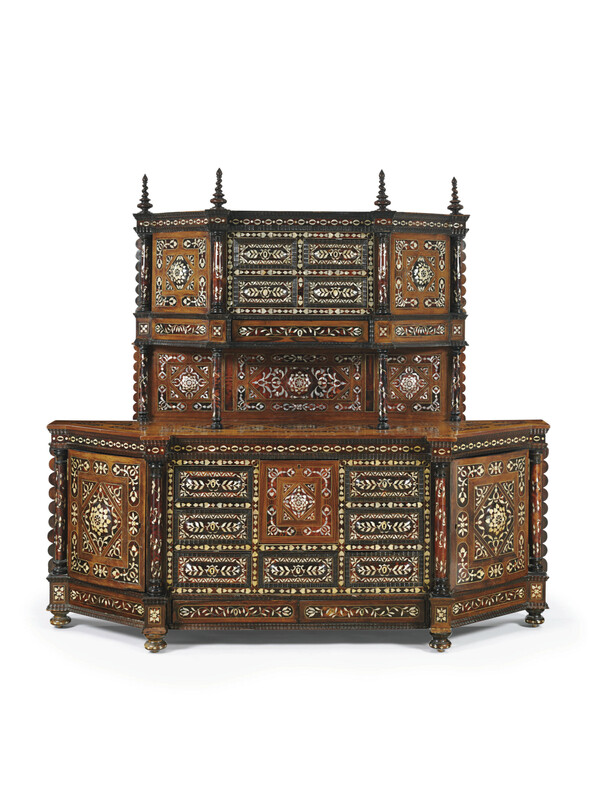 Mueble enconchado, or mother-of-pearl-inlaid furniture, was a sumptuous and highly sought-after style in Colonial Latin American society, which originated in the Spanish Philippines in the early 17th century. The use of rare and expensive materials such as mother-of-pearl and tortoiseshell inlay decoration made them grand showpieces. The prototype was made as a wedding gift for the grand-daughter of the Viceroy of Peru and is now in the Dallas Museum of Art (H. Hayward, World Furniture, New York, 1965, p. 106, fig. 371). A similar cabinet to the present example, with a smaller conforming superstructure, is illustrated in J. Rishel and S. Stratton-Pruitt, The Arts in Latin America 1492-1820, 2006, pp. 491. It is dated to the 18th century and is now on display in the Museo Pedro de Osma in Lima Peru. A closely related cabinet was sold anonymously, Christie's, New York, 21 November 1995, lot 50. A further related cabinet was also sold anonymously by Christie's, New York on 11 January 1994, lot 151.